From his big white bird did the President descend upon his dreading European hosts, looking much like natives waiting to be slaughtered or ravished. 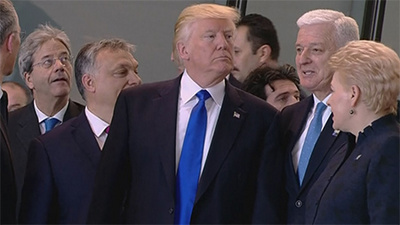 As Donald Trump pushed his way through NATO members (the Montenegrin prime minister, for one, felt his forceful shove), representatives shot glances of discomfort and bemusement. In a refreshing blast of brutishness, the Ugly American, made flesh in the incarnation of Trump, was explaining, even hectoring Washington’s allies. Muscular, military buffoonery comes at a high price, usually to the filched tax payer. But the issue of where the money goes is almost as important as whether you have it. The largest military power on earth was tired about having to provide a shield of defence without some local compensation, and here, its President was claiming some form of fictional proprietorship. Why, wondered Trump, were NATO members not pulling their military weight not so much over their defence as the obligations owed to the US? Back payments were due, and The Donald was under the erroneous impression that they had to be paid directly to the US. It takes much for the otherwise unadventurous USA Today to stake any claim accurate reportage, let alone tough critique, but in a piece on the president’s NATO adventure, the paper concluded that NATO members were “not in arrears in military spending”, nor were they “in debt to the United States”. There was, in fact, no debt to have. A more interesting point for the eye sored arms watcher is that the US, for all its fears about the rising tide of Chinese power, continues to dwarf the combined defence expenditures of the next four powers. Freedom land remains its own burgeoning arsenal, modernising, acquiring and misspending like a drunken lord. Given such a curtness, the more security-minded among the NATO partnership wondered about whether the celebrated Article 5, one guaranteeing US support in the event of attack from a foreign power on a member state, might be abided by. They were left disappointed, even as they looked on at the dedication of a memorial to NATO’s invocation of the Article after the 9/11 attacks on US. In this sense, the Trump show reveals itself in all its unpatriotic worth, a case of business before country, of Brand USA before multiple alliances. That point is missed by those entrusted with the task of reading the tea leaves and deciphering the smoke signals coming from the greatest reality show on earth: the White House. “That he couldn’t even say some very benign words that would’ve meant a lot to our allies was really striking,” claimed Loren Schulman, former member of the National Security Council. The promise on increased payments were already being engineered after 2014, when NATO members gave a commitment to push military contributions to 2 percent of GDP. The commitment was hardly achieved by blood ritual, but this was a pre-Trump world of diplomatic caution. That time scale was longer than any Trump programme could ever be: an entire decade. What matters now is instant gratification, and swift dangerous performance. Shorter and louder, in other words, is better. Indeed, the expression “The Ugly American” says it all, although Donald Trump thinks of himself as the handsome blue prince who came to awake the princess; a narcissist always thinks of himself as “beautiful” or at least a handsome beast hiding his charm. On the other hand the expression "Ugly American"also implies that there are Americans and there are Americans. There are boorish corrupt Americans, and there are those Americans who will eventually investigate and prosecute those boorish Americans who reduce the best and noblest things in life, such as liberty and democracy, to a mere mercenary transaction. The genius of the democratic system is that it is self-perfecting and self-correcting. That of course remains to be determined for democracy all over the world, in some way remains an experiment on human freedom. In any case, the crucial issue at this sad stage of the life of the North Atlantic Alliance is the same as that announced by Franklin as he and his colleagues signed the declaration of independence way back in 1776: “gentlemen, either we hang together or we shall surely hang separately.” That advice is quite apt and wise for any unions of democracies, be they called American colonies, or US, or NATO, or EU, or North Atlantic Alliance. The omens are bad, we shall need some luck, but history will eventually render the final judgment.